Our last evening on the Platte was just amazing. We were on a bridge watching cranes come back to the river. For an hour they just poured onto the Platte. Wave after wave they came. At times the "show" was just so overwhelming that all photography stopped. All we could do was just watch. 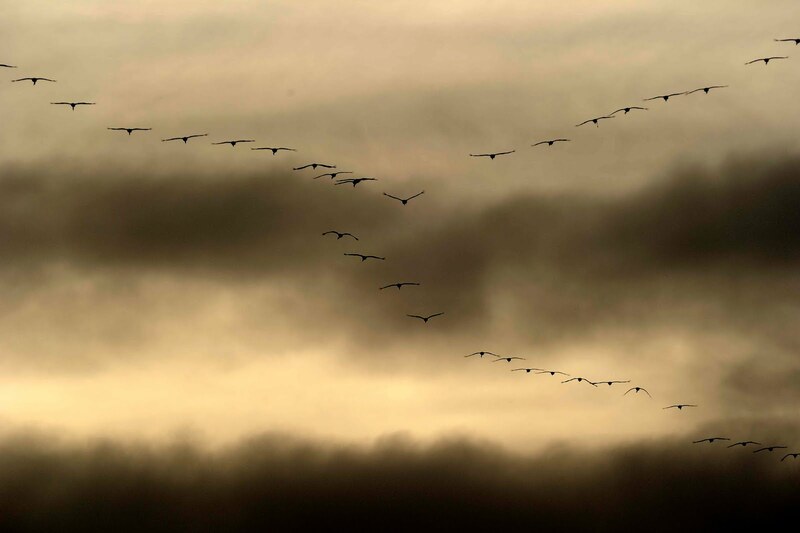 I began to look for some cool patterns that the birds formed as they headed west. Once again, very few photographers. Moose and I were the only ones there that night taking pics. Everyone else was just watching. Which was just fine. But it was very curious that there were not more photographers. Moose kept wondering why so few photographers at this magical place. I had no answer. Just grateful to be there. Nikon D3S? Did you trade up from the D90? I wish. I am borrowing this body until this weekend. Then I have to send it back. I am sure I will cry. It is way cool to shoot with.